Not to be confused with Hergé's Adventures of Tintin. "The Adventures of Tintin Theme"
The Adventures of Tintin is a French/Belgian/Canadian animated television series based on The Adventures of Tintin. It is based on a series of books written by Belgian cartoonist Georges Prosper Remi, known by the pen name Hergé ([ɛʁʒe]). It debuted in 1991; 39 half-hour episodes were produced over the course of its three seasons. The television series was directed by French director Stephen Bernasconi (with Peter Hudecki as the Canadian unit director. Hudecki was the primary director, but could not be credited as director because of coproduction restrictions.) and produced by Ellipse (France) and Nelvana (Canada) on behalf of the Hergé Foundation. 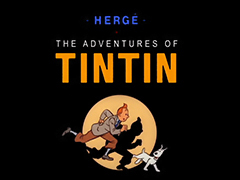 It was the first television adaptation of Hergé's books since the Belgian animation company Belvision was responsible for Hergé's Adventures of Tintin 20 years earlier. Philippe Goddin, an expert in Hergé and Tintin, acted as a consultant to the producers. The series' writers included: Toby Mullally, Eric Rondeaux, Martin Brossolet, Amelie Aubert, Dennise Fordham, and Alex Boon. The series used traditional animation techniques and adhered closely to the original books, going so far as to transpose some frames from the original books directly to screen. In the episodes "Destination Moon" and "Explorers on the Moon", 3D animation was used for the moon rocket—an unusual step in 1989. Each frame of the animation was then printed and recopied onto celluloid, hand painted in gouache, and then laid onto a painted background. The rocket seen in the title sequence is animated using the same 3D techniques. Artistically, the series chose a constant style, unlike in the books. In the books, the images had been drawn over the course of 47 years, during which Hergé's style developed considerably. However, later televised episodes, such as the "Moon Story" and "Tintin in America," clearly demonstrated the artists' development during the course of the production of the television series. It was filmed with English language narration, but all visuals (road signs, posters, and settings) remained in French. Certain aspects of the stories posed difficulties for the producers, who had to adapt features of the books for a younger audience. Nevertheless, this series was far more faithful to the books than the earlier Hergé's Adventures of Tintin, which was made from 1959 to 1963. Some examples of these changes included toning down the high amount of violence, death, and the use of firearms in many adventures. Tintin's role was slightly downplayed and he scolded his dog Snowy less often than he did in the books. Twice in the series, Tintin is portrayed as knowing various characters already (Thomson and Thompson and Allan in "Cigars of the Pharaoh" and Piotr Skut in "The Red Sea Sharks"), when it was the first time they had met in the book version. On these occasions Tintin had already interacted with these characters in the TV series, as stories were shown in a sequence different from the books. Haddock's penchant for whiskey posed a problem for audience sensitivities. While the original books did not promote alcohol, they featured it heavily, with much humor based around it and the results of drinking. However, in many countries where the producers hoped to sell the series, alcoholism was a sensitive issue. Therefore, international versions of the series had some alterations. Specifically, Haddock is often seen drinking, but not as heavily as in the books. "The Crab with the Golden Claws" is the only adventure where Haddock's drunken state is not downplayed. In "Tintin in Tibet", Haddock is seen taking a sip from a whiskey flask in order to set up a scene in which Snowy is tempted to lap up some spilled whiskey and subsequently falls over a cliff. In "Tintin and the Picaros", Haddock is the only person taking wine with dinner, foreshadowing the use of Calculus' tablets to cure the drunken Picaros. Haddock is also seen drinking in "The Calculus Affair" and in "Explorers on the Moon", setting up the scene where he leaves the rocket in a drunken state. However, he keeps the bottle in the refrigerator (instead of hiding it in an astronomy book, like he did in the book), making it less obvious for young viewers that it is alcohol. Tintin in America: This is the most altered episode, amounting to an almost completely new story. The Native American aspect of the original tale was removed and the gangster element given the main focus. In the book, Bobby Smiles is the head of a rival gang to Al Capone, but becomes an "employee" of Capone's in the televised episode. All the criminals are led by Al Capone, who is captured at the end. Artistically, the episode was produced to the same standard as the others, but the backgrounds boast greater detail and more cinematic shots. The ending was also rewritten. Unlike in the book, where Tintin returns safely to Europe, in this episode he receives a phone call about an unknown situation, and leaves his hotel room to solve it, ending the episode and the entire series. Cigars of the Pharaoh: In the TV episode, Tintin's cruise is transported from the Mediterranean Sea to the Indian Ocean and scenes showing the criminal boss writing orders already hint at the boss being Rastapopoulos by his voice and by clothes matching his preceding appearances. Also, the dream sequence when Tintin passes out in the tomb is made more frightening when the Pharaoh's emblem (colored red and slanted to look more like a no symbol) melts into a smoke that appears to be blood and eventually transforms into a disfigured skull-like apparition. The gunrunner's role was much reduced. Furthermore, the mental hospital cell is a padded cell; in the book it has a bed. Also, in the book, Tintin is imprisoned in the asylum because of a forged letter planted by the fakir; in the TV episode, Dr. Finney is a member of the gang and writes the letter to frame Tintin. Tintin is not recaptured by the asylum as in the books; instead the maharaja's son finds him. Also, the poet Zloty is absent in the episode. In the comic, Doctor Sarcophagus ends up in the asylum, while in the TV episode he does not. In the TV series, Tintin is already friends with Thompson and Thomson when they try to arrest him on the ship; he also recognizes Allan Thompson among the gang members (replacing an unnamed Japanese). Tintin had already interacted with these characters in earlier TV episodes but not in earlier books. The Blue Lotus: Mitsuhirato's manservant is shown to be a double agent in the service of the Sons of the Dragon, and it is he who replaces the Rajaijah poison with a harmless substitute, and delivers the real poison to his employers. In the book, this was done by another agent. Gibbons is not shown at all, and Dawson's role is much reduced, as he is only shown as the police commissioner who calls in Thompson and Thomson, and does not appear to be in league with Mitsuhirato. (This creates a subsequent continuity error in "The Red Sea Sharks", as Tintin mentions having a "run-in" with Dawson despite not encountering him in this story). Also in the book, Chang's parents were killed in the flood, but in the TV episode Chang had an orphanage which was washed away by the flood. At the end of the story line, Rastapopoulos tries to flee through the Blue Lotus club when the other villains are apprehended, but is himself caught by Thompson and Thomson. In the book, Rastapopoulos was apprehended along with Mitsuhirato. Also, the episode, unlike the book, does not reveal Mitsuhirato's fate. The Broken Ear: In the intro of the TV episode, the janitor of the museum is shown whistling instead of singing unlike the book and the word "fetish" unlike the book is called "idol". Tortilla is completely missing from the plot, and is replaced by Walker's aide, Lopez (who is not described as a half-caste). Further, Colonel/Corporal Diaz and the entire subplot involving the rivaling petroleum companies are removed, and accordingly, Tintin never falls out of favor with General Alcazar, and Alonzo and Ramon never find Tintin in the Amazon. Instead, they disappear from the story line after Tintin escapes from them in San Theodoros, and do not appear again until the climax. Also, Tintin's disguise to spy on Ramon and Alonzo is changed from the blackface makeup he uses in the book to a false mustache and glasses in the episode. While in the book, Tintin walks alone back to Sanfacion, Nuevo Rico after being caught by Alonzo and Ramon, in the episode he is escorted (off screen) by Ridgewell and the Arumbayas to San Theodoros. At the end of the episode, Tintin saves Ramon and Alonzo, whereas in the book they drown and disappear into Hell, though it is speculated that this may be an imaginary scene or hallucination. Pablo and Trickler do not appear. (The former creates a cartoon adaptation of "Tintin and the Picaros" where the young reporter meets him.) The parts of the characters Trickler, Basil Basarov and Corporal Diaz were completely removed. The Black Island: Ranko, the gorilla, crushes the rock Tintin throws at him, something he did not do in the book. Also, in the episode, the counterfeiting gang based in the castle comprises only Puschov, Dr. Müller, and Ivan; in the book, there were two more members, and some of the names were switched (Ivan was instead one of these characters). King Ottokar's Sceptre: In the book, the true professor smokes while the impostor does not; this is reversed for the TV episode, and Tintin also learns of the twin Alembicks much earlier in the episode than in the book. And in the book, Tintin crossed the border because he got hungry and was chased back by frontier guards, while in the episode Tintin accidentally crosses the border while following a Bordurian fighter to its airfield. In the book, Tintin got the clue that the camera was faked from a toy store, while in the episode Tintin got the clue by looking at the cannons outside Kropow Castle. The Crab with the Golden Claws: The episode starts with a scene of a meeting between Bunji Kuraki and Herbert Dawes, which is only referred to in the book. Tintin later encounters an imprisoned Kuraki, which is not depicted in the book. He tells Tintin about Allan's plans. In the book, Tintin sees the drugs with his own eyes. Captain Haddock does not start a fire on the lifeboat that he, Tintin and Snowy use to escape the Karaboudjan. The plane crash before the desert is also changed. In the book, Haddock is drunk and hits Tintin with a bottle, only to row himself. In the adaption (and in the 50-60s adaption also), Haddock is innocent, and they let the pilot (the other is removed) attack Tintin. As in the 50-60´s adaptation, the ending is rewritten, replacing the fishing net with a rope. The Shooting Star: The part of Philippulus the Prophet is significantly reduced. He is seen at the start of the episode when Tintin reaches the observatory and when he is having a 'nightmare'. These appearances were reduced and others, such as Philippulus' "occupation" of the Aurora's crow's nest, are completely missing. The Aurora's fuel stop in Akureyri, Iceland was likewise left, and Captain Chester is absent in the episode. Also, they see the Peary through binoculars aboard the Aurora, instead of from a seaplane. The Secret of the Unicorn: The Great Dane, Brutus, is not shown. Also, when Haddock takes Tintin out of his apartment to show him the painting of the Unicorn, someone is shown watching them and then breaking into Tintin's apartment. In the book it is only revealed that there was a robbery when Tintin arrives home and finds his model Unicorn missing. Finally, a change was made to the scene in which Tintin is kidnapped and taken to Marlinspike Hall: rather than two unknown "delivery men", as depicted in the book, it is the Bird brothers (Max and Gustav) themselves who kidnap him. Also, the "speaking tube" in Marlinspike Hall where Tintin talks through it to the Bird brothers is replaced with an intercom. Furthermore after being defeated, the Bird brothers are arrested on the grounds rather have Max escaping and having to be arrested at the national border. Also in the scene where Thomson and Thompson meet the pickpocket Artistides Silk, Silk doesn't mention that he's a kleptomaniac in the TV episode unlike the book. Red Rackham's Treasure: The changes are made solely for time, such as the only consequence of the press exposure is their meeting with Calculus. Calculus during his first meeting with Tintin and Haddock did not mention to both that he's a little hard of hearing which he later mentioned in "Destination Moon" when he uses an ear trumpet. In addition, Capt. Haddock does not write a message on a wall to tell Calculus that they are not interested in his invention, the Captain simply marks an "X" on the crate containing the submarine assembly to account for why Calculus stows away anyway and for the animators to avoid having to make multiple written translations for each language used. Tintin has a smooth voyage in the shark submarine, as opposed to the book, where Tintin is in peril when the vehicle is snarled with seaweed. Furthermore, the treasure hunters never return to the island to dig around a large wooden cross because of a mistaken idea of where the treasure could be since Tintin comes to realize why that would be useless while returning from the island from the story's only landing. In addition, Tintin is the only one who does the diving and it is he who finds the cache of Jamaican Rum and Captain Haddock takes the discovery calmly. The Seven Crystal Balls: The episode begins with the Seven Explorers of the Sanders–Hardiman Expedition finding the Mummy of Rascar Capac. Jolyon Wagg also makes a cameo appearance at the theater. Following the chronology of the books, Jolyon Wagg does not appear until "The Calculus Affair", but as the TV episodes of "The Calculus Affair" aired before "The Seven Crystal Balls", Wagg's appearance is credible when the episodes are viewed in that order. Prisoners of the Sun: The changes are made solely for time, such as Tintin and Haddock's execution being reduced to one day instead of eighteen, and some of the action in the jungle being reduced or toned down. Land of Black Gold: The car repairing parts featuring Thompson and Thomson were cut out. Mohammed Ben Kalish Ezab was given a more sympathetic and caring role and lets Tintin and Captain Haddock take his car whereas in the book, he does not. The role of Abdullah is downplayed, and he does not seem to cry as much as he does in the book. Also, the Emir already knows what Dr. Müller's real name is, while in the book he knows, and calls him Professor Smith, and knows his actual name at the end of the book. The half-destroyed Marlinspike Hall was shown on TV, while in the book, it was a photo taken by Professor Calculus. When Dr. Müller asks Tintin to destroy Formula 14 in exchange for riches, Tintin sternly refuses because he cares for his friends; in the book, he merely states that he was not interested. Destination Moon: The episode directly started with Tintin, Snowy and Haddock landing on Syldavia. Again, the cuts are made solely for time, such as Tintin's misadventure with a pack of bears, Haddock's tantrums over the space trip, and a few other incidents like a false fire alarm. Explorers on the Moon: Tintin's attempt to rescue Haddock from his impromptu spacewalk around the asteroid Adonis is made more dramatic and heightened than in the book, with both of them getting pulled into orbit and Tintin having to use a grappling iron to return them to the rocket. Despite that, the tense nature of the adventure is toned down somewhat with Snowy's rescue from the cave omitted from the story. The spymaster behind Jorgen has also been omitted. The Calculus Affair: The Syldavian group, which is also trying to abduct Professor Calculus, is removed for simplicity. Also, in the original book, Calculus was kidnapped earlier in the story. In addition, Jolyon Wagg's family has been removed from the storyline, and his appearances reduced by half. Also in the TV episode, Calculus was also shown meeting Tintin and Haddock in the hospital after the blast in Topolino's house unlike the book where Calculus's next appearance was being kidnapped and taken away in a motor boat. The Red Sea Sharks: The original book dealt with the topic of modern slavery, but the television episode was centered around smuggling of refugees: they were not meant to be sold, but killed after handing over all their money. Furthermore, while the Africans in the book volunteered to be simply stokers for the ship that Captain Haddock commands, the television version (changing them from Africans to Arabs) makes a point of having them doing more sophisticated work on the ship (although this is implied in the book). Bab El Ehr himself is entirely deleted from the storyline; as a result, Dr. Müller's role is expanded, and he becomes the leader of the attempted coup d'état rather than just being one of Bab El Ehr's military commanders. Also, the scene in which the Mosquitoes bomb the armored cars is rewritten — in the book, Müller is safely inside headquarters, and gives orders via telephone, whereas in the episode, Müller is in one of the vehicles and communicates via radio. Jolyon Wagg is also absent, and the last scene depicts the exploding firework in a chair, another trick from Abdullah. Tintin in Tibet: One notable omission from this episode is the stopover in New Delhi during the quest to save Chang. Also, the nightmare Tintin had and Chang calling him is seen, while it was not in the book. The Castafiore Emerald: Unlike the book, when Castafiore arrives she still gives Captain Haddock the parrot Iago as a gift, but the parrot's part is significantly downplayed; as such, the bird does not manage to pick up much of Haddock's verbal slang, sparing the Captain from further annoyance. Also, unlike the book, Castafiore trips over the broken stair (in the book she is the only character not to). Miarka is much friendlier towards Tintin and Haddock and does not bite the Captain. Miarka's uncle is less hostile to Tintin and Haddock and does not try to throw a rock at Tintin as in the book. Neither does he think Marlinspike Hall's inhabitants have a deep hatred for him and the other gypsies. The scene when Thomson and Thompson confront the gypsies is shown. Flight 714: Rastapopolous says that he was planning to shoot Dr. Krollspell, whereas in the book he merely says "eliminate", and does not reveal plans for the other crew members or the Sondinesians. Also, the shootout that Tintin and Captain Haddock have with Alan and his men is longer than in the book, and Alan does not have his teeth knocked out by the Sondonesians. In the end, the spaceship drops Krollspell off in India; in the book it drops him off in Cairo (although the original French version also had Krollspell transported to India). The group is hypnotized after they get on the spaceship; this is perhaps more believable as the volcano was about to explode. Jolyon Wagg and his family is omitted from this episode. Mik Kanrokitoff's Russian accent is toned down in this version. In addition, Tintin does not reveal that he is going to Sydney. Tintin and the Picaros: Hergé presents a less naive Tintin who refuses to go with Haddock and Calculus to rescue Castafiore and the detectives, knowing it is a setup. He only joins them later, after his conscience gets the better of him. Many fans felt it was out of character for Tintin to refuse to go to South America. In the television episode, Tintin is all for rescuing his friends, and goes with Haddock and Calculus early in the adventure. In the original comic, Tintin wore bell-bottoms throughout the book, which was in contrast with the plus-fours he had always worn previously - the plus-fours are restored for the episode. The encounter with Ridgewell and the Arumbayas is also removed as is the moment when Captain Haddock's first name is revealed. Pablo's fate remains undetermined as well. Tintin in America, The Shooting Star and Red Rackham's Treasure are the only stories to be told in one part instead of two. In the second part of the stories, Tintin narrates some of the events of the first part at the beginning. Throughout the books, Snowy is frequently seen to be "talking". It is understood that his voice is only heard through the "fourth wall", but this verbal commentary is completely absent in the television series. Three of the Tintin books were not included in the animated series. These were the first two (Tintin in the Land of the Soviets (due to its unflattering portrayal of Russians) and Tintin in the Congo (due to issues around animal abuse and its perceived racist colonial attitude towards the native Congolese) and the final unfinished Tintin and Alph-Art. The underscore music and the main title theme for the series were written by composers Ray Parker and Tom Szczesniak. The music was recorded by engineer James Morgan. Excerpts from the score were released by Lé Studio Ellipse on CD and cassette in conjunction with Universal Music Group, on the StudioCanal label. It is now out of print in both formats. Hergé, the creator of Tintin, makes a number of Hitchcock-like cameo appearances in the cartoon series—as he often did in the original books. Most of the time he is just a passing figure in the street, such as when he is checking his watch in The Blue Lotus or a reporter (The Broken Ear) or a technician (Explorers on the Moon). These brief appearances, however, are not sporadic as he is featured in all of the TV episodes. His letter box can even be seen next to Tintin's in The Crab with the Golden Claws. Other cameos are less flattering: he is a gangster in Tintin in America and an inmate at the lunatic asylum in Cigars of the Pharaoh, along with his fellow artist and collaborator Edgar P. Jacobs. In France, the series originally aired on May 5, 1992 on France 3 with reruns on M6. In Canada, the series originally aired on Global, Family Channel, and on Radio-Canada in Quebec, with reruns subsequently aired on YTV, CBC, and Teletoon Retro. In the United States, it originally aired on HBO with reruns subsequently aired on Nickelodeon. The series originally aired in the United Kingdom on Channel Four on terrestrial television and Family Channel, a channel based on CBN's Family Channel available through the original Sky system. It was later broadcast on Sky One until the show was purchased by Five. In Israel, the series was dubbed into Hebrew by Elrom Studios and broadcast on the Israeli Channel 2, then later on the Israel Broadcasting Authority. Tintin became very popular among kids and adults in Israel, and the show was aired for several years rerunning many times. In Australia, the series was broadcast by the Australian Broadcasting Corporation as part of their ABC Kids programming block, as well as on the ABC2 digital channel (5 April 1993 – 21 April 2006). Its complete run has been shown at least twice, leading to screenings of the Belvision Hergé's Adventures of Tintin. In October 2010, it was being aired on Boomerang. Later, it stopped airing on TV in Australia. In New Zealand, the series was originally aired on TV2 of Television New Zealand and TV3. It continued to be rerun on TV2 and TV3 for a few years, and was then featured on Cartoon Network. In South Africa, the series was broadcast by KTV, a daily children's program, on M-Net. In India, the series was broadcast by Cartoon Network in the summer of 2000 with a Hindi dub by Sound and Vision India. The original run was followed by many reruns. Doordarshan's DD National and Zee Alpha Bangla also showed the series with the original Hindi dubbing. Gemini TV aired the series in Telugu around the same time as Sabash Tintin. In 2013, it returned on Discovery Kids during Republic Day 2013, but with a new Hindi dubbing voice cast and produced by a different dubbing studio. In the Philippines, it was aired in GMA-7 in the mid-1990s as part of the afternoon cartoon schedule. In Brazil, the series was aired in state-owned TV Cultura and TVE Brasil in 1996 and early 2010s. In Sri Lanka, the series was aired multiple times, first in early 2000s and the last time it was broadcast was in 2012 by the popular TV channel called "Sirasa TV". Running order of the TV Series as per original broadcast schedule. Along with fans, critics have praised the series for being "generally faithful" to the originals, with compositions having been actually taken directly from the panels in the original comic books. ^ "Tintin finds his way to America's HBO". Baltimore Sun. Retrieved 25 August 2010. ^ Elsworth, Peter C. T. (24 December 1991). "Tintin Searches for a U.S. Audience". The New York Times. Retrieved 25 August 2010. ^ "Popular Belgian comic-strip character 'Tintin' to get mega-boost on U.S. cable TV". Baltimore Sun. Retrieved 25 August 2010. ^ "Hergé's cameo appearances". Tintinologist.org. 2009-03-27. Retrieved 2016-09-11.